The Commission is conducting the Combined Higher Secondary (10+2) Level Examination (Tier-I), 2017 from 4.3.2018 to 28.3.2018. The examination has been conducted at 442 venues in 101 cities for 63,49,545 registered candidates across the country. 26,51,962 candidates have taken the examination. This examination was conducted successfully without any major incident under strict surveillance and elaborate security arrangements. With the help of our readers and followers, Team Super Pathshala have managed to collect almost all questions and response sheet of SSC CHSL 2016 Tier 1 Examination. We are sharing all those questions here in this post. The actual credit goes to all the kind and helpful aspirants who took time and efforts from their busy schedule and e-mail their Questions Sets to Super Pathshala. As promised we have maintained Privacy of all the candidates. We have complete Sets of All Dates and Shifts, Thanks to our generous followers. If want to contribute us please mail your ansswer sheets(in html format) to us at superpathshala.com@gmail.com. 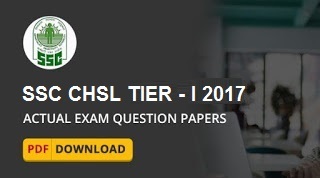 Bookmark this page SSC CHSL 2017 Tier-1 All Question Papers with Answer keys PDF Download for future access.